RANGOON — Local relief workers in Arakan State’s Kyauktaw Township say that they have been barred from providing support to hundreds of villagers in the area, who were displaced after fighting between the Arakan Army and government troops. 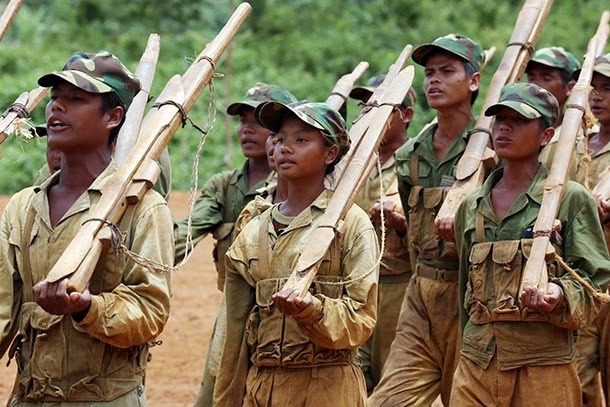 Clashes beginning on Friday and continuing over the weekend saw some 450 people from the villages of Pinglong, Aung Lan Chaung, Dan Chaung and Kalakya flee to the nearby village of Zapazeik, about 40 kilometers (25 miles) northwest of Kyauktaw town. A group of Arakan locals, who banded together to provide aid to the villagers, said they were turned back by military checkpoints outside Kyauktaw town when they attempted to deliver aid supplies on Tuesday. The team traveled 100 kilometers south to Sittwe on Wednesday to seek permission to travel to Zapazeik from the state government. Representatives of the Arakan State government and Kyauktaw Township officials could not be reached on Wednesday. Zaw Worn said his relief team was formed after he received phone calls from the villagers requesting urgent support. They were turned back at the first checkpoint they encountered, which was manned by the Burma Army’s 374th Infantry battalion. “We were not able to provide them with basic needs like rice, cooking ingredients, and mosquito nets,” he said. Many of the displaced came from Aung Lan Chaung village, largely populated by members of the Mro ethnic minority, which relief worker Nyo Aye said was razed by Burma Army troops over the weekend. Local aid groups in other Arakan State towns are also collecting relief supplies for the area. Ko Ko Maung, a resident of nearby Buthidaung Township, said that the community had donated a stockpile of goods and he intended to make a delivery to the displaced villagers soon. The Arakan Army, which is not recognized by the Burmese government as a party to the nationwide peace process, has been operating in the state for about three years. While clashes between the Arakan Army and government forces have been rare, an earlier outbreak of fighting in the area was reported on Mar. 29. State-run newspapers reported on Wednesday that five Arakanese insurgents had been arrested on Sunday evening with some weapons and ammunition, and said the Arakan Army was in retreat. Nyo Tun Aung, the Arakan Army deputy chief of staff, said that an internal investigation was being conducted to determine whether the captured men belonged to his forces.